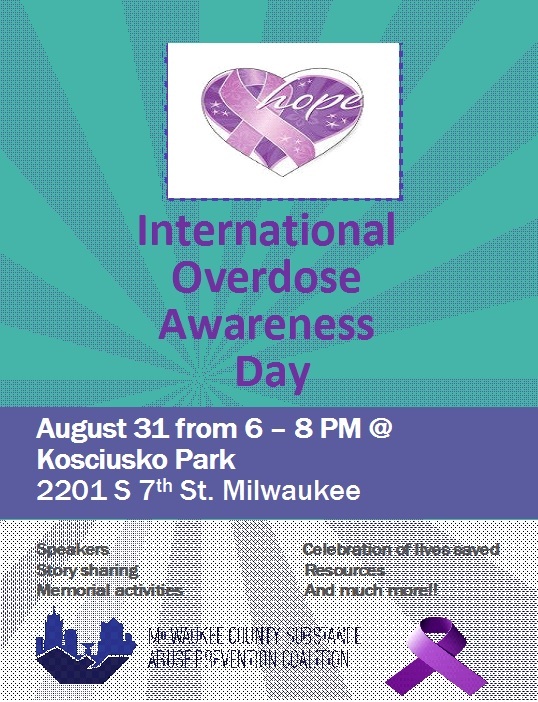 The Milwaukee County Substance Abuse Prevention (MCSAP) coalition invites the public to gather at Kosciusko Park in Milwaukee to recognize International Overdose Awareness Day from 6 to 8 p.m. on Thursday, August 31. The event will feature speakers, personal story sharing, memorial activities, resources, and a celebration of lives saved. “We encourage community members to join us as we recognize the thousands of lives impacted by overdose and to raise awareness of how overdoses can be prevented in the future,” said Rachael Cooper, MCSAP Opiate Workgroup Chair. Like the rest of the country, the Milwaukee metro area is battling an opioid epidemic that is responsible for a shocking number of overdose deaths—as well as even more nonfatal overdoses. According to data from the Milwaukee County Medical Examiner’s Office compiled by Milwaukee Community Opioid Prevention Effort (COPE), fatal opioid overdoses doubled between 2012 and 2016, from 144 to 294 lives lost in the county. A full 97 of those deaths in 2016 were caused by fentanyl, an opioid that’s 50 to 100 times more potent than morphine. The Medical Examiner reportedly is preparing for a record 400 overdose deaths in 2017. But overdose deaths are only part of the opioid epidemic story. Nonfatal opiate overdoses outnumbered fatal overdoses by about three to one in 2016, meaning that there are many overdose survivors who need support. And individuals can overdose on other substances, such as alcohol, stimulants, or a combination of substances. “Since addiction has the power to destroy relationships and isolate individuals, we want to remind anyone affected by drug overdose that they are not alone,” said Shea Halula, Co-Chair of the MCSAP Opiate Workgroup. International Overdose Day was launched in 2001 to provide a platform to acknowledge the grief felt by families and friends who have lost a loved one to overdose. “Coming together as a community at events like this one can help to heal wounds and give courage to those who are struggling with addiction or loss,” said Deavon Collins, Coordinator for the Partnership for Success and a member of the MCSAP Opiate Workgroup. When: August 31, 6 to 8 p.m.
Why: To remember lives lost, support survivors, and prevent future overdoses. The Milwaukee County Substance Abuse Prevention coalition (mcsapcoalition.org), is a countywide initiative aimed at reducing youth marijuana use and preventing fatal drug overdoses, with an emphasis on prescription drugs. Community Advocates Public Policy Institute helps to staff the coalition and provide resources for its work. Hi Lisa.Great article.There two reasons that the person will suffer overdose possibly accidentally or intentionally.I’ve read an article awhile ago that Xanax was categorized as Schedule IV drug because it was shown to have a low abuse potential compared to other drugs.Do you agree?